How Big is the Bengal Tiger? The size of a tiger must include information about both length and weight. Another book that I have about tiger conservation: Riding the Tiger (ISBN 0-521-64835-1), publishes data on skull sizes as a measure of variation on tiger size. The book describes why there is a distinct variation on tiger size amongst the subspecies of tiger. The Bengal tiger is one subspecies and even amongst this subspecies there is a weight range. Tigers in the Russian Far East (Siberian or Amur tigers) are the largest subspecies of tiger. The smallest are on the Sunda Islands (and, in general, in Southeast Asia and Indonesia). “[Bengal] tigers in the northern Indian subcontinent are as large as Amur tigers”². It is clear that in cooler climates the tiger is larger. Why is this? In cooler climates tigers have to generate more heat to maintain body temperature than in warmer climates. Smaller tigers lose body heat more easily because they have “a greater surface area to the volume of their bodies than larger¹….[tigers]”. Therefore the Bengal tigers in the north have evolved to become larger as this reduces relative body surface. That, I believe you will find, is the main reason why Bengal tigers in the north of their range will tend to be larger than those in the south and why the Siberian tiger is the largest subspecies of tiger. The figures for the length of body and tail in the picture of the Bengal tiger on this page comes from The Wild Cats of the World (page 367) by the Sunquists and the source they have relied on is a study: Predator-prey relationships among the large mammals of Nagarahole National Partk (India) by KU Karanth 1993. The Nagarahole reserve, incidentally is in the south of India (see Bengal tiger reserves). The lengths of body and tail are from the largest of three male tigers in the park that were measured in the study. Of course weights and size vary a lot between individual tigers. 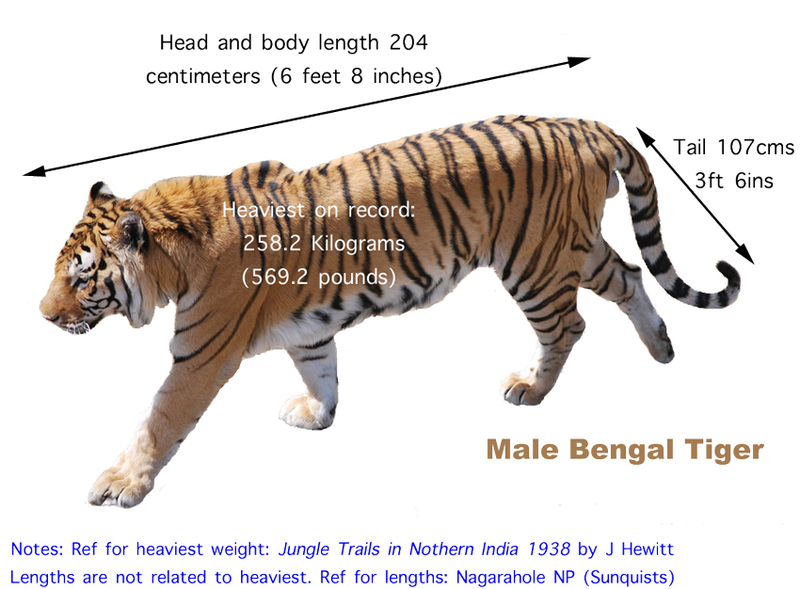 I would be cautious about information on the internet on the subject of the size of Bengal tigers. There will be a lot of anecdotal evidence (informal and unverified). And people can tend to exaggerate especially when it comes to the tiger. For a comparison of wild cat species weight and size please see this page. The lion is smaller than the tiger. Riding the Tiger page 30. Riding the Tiger page 23. This entry was posted in Tiger, Wild Cat Species and tagged bengal tiger, largest cat, tiger, wild cat species by Michael Broad. Bookmark the permalink. According some recent study bengal tiger are no more smaller than Siberian tiger. Though I think Siberian tiger still have larger head and long body when compared to bengal. While bengal tiger are more heavier. They are full of this information and discussion. Your welcome Michael. I love your blog. Hi, the Sunquists in Wild Cats of the World record the largest male Siberian tiger from Russia at 325 kgs (716 pounds). The smallest was 195 kg. The length of the largest was 2,900 mm (290 cms) from head to base of tail (9 and a half feet). It is said that the Siberian tiger has become smaller. In the past the largest were around 364 kgs.